DID YOU HEAR WHAT I HEARD AT THE LAST HOA MEETING? Attending our neighborhood HOA meetings in Timberwood Park is one of the many ways to keep up with what’s happening in the neighborhood as well as receive recent updates on things the board and/or our management company might be working on. The June HOA meeting was attended well, probably around 60 or so property owners, 3 attorneys from the HOA legal team, Spectrum management attendee, and the board. The attendance was no doubt a bit larger than usual due to the recent Texas Supreme Court Ruling against the HOA which was addressed in the last blog post. If you want the ruling once again to read, click here. Please read the blog entry prior to this one for further details. The meeting was called to order with approval of the minutes from the April HOA meeting by the board. It was followed by a brief statement of the funds collected and the aging report of those funds which are still outstanding. There wasn’t a financial report since no expenses were provided to give property owners the latest on where their money is being spent. Spectrum stated there is a financial on their web page which states the status of our accounts, but the last one posted was April,2018 at the time of the meeting. The board recognized Chris Martinez for his work in helping with park staffing and the many projects which need to be managed throughout our neighborhood. It was noted that Robert Jung, who has been a constant in Timberwood Park clear back to GG Gale days, retired May 15, 2018, and wanted to go without a lot of fuss and muss so no farewell party or gathering was planned. Robert will be enjoying fishing and lots of free time now! We are grateful for his many years of unparalleled service to our neighborhood and our property owners. Never had an unkind word to say, always had a smile on his face and welcomed property owners input for maintenance and upkeep of the park. Robert, you’ll be missed by many of us! The board opted to title the next item on the agenda “short term lease issue update”. This item refers to the Texas Supreme Court Ruling unanimously to overturn the HOA’s earlier win on this case and rule in favor of the property owner. This is where the evening became interesting. IMPORTANT NOTE: As has been reported and written about for the last 2+ years in this blog and on other social media sites throughout the neighborhood, the bottom line here is the deed restrictions for the unit in which you live, as well as any other of the 60+ units in Timberwood Park CANNOT BE REWRITTEN, CHANGED, AMENDED, without a vote of all the owners of a given unit in majority to do so! Three members of the legal team which represents our development HOA, Roberts Markel Weinberg Butler Hailey PC were in attendance and began a discussion with the attending property owners about the ruling. Mr. Markel took the lead in telling us that he was “our” attorney not just the HOAs attorney and that he represented all of us as did his firm. In my opinion, Mr. Markel seemed to be quite uncomfortable, irritated with questions from the property owners, and in general not really interested in answering much that was asked. The discussion regarding this recent ruling against the HOA and in favor of the property owners began with an explanation that the property owners brought the lawsuit and thus the HOA “HAD” to defend it. The HOA did not sue the property owners. An audience member asked why a property owner would sue unless the HOA was sending them threatening letters, fines and other documents attempting to get them to cooperate with the position the HOA had taken for their issue. The answer back from both the board and the legal team was that letters had in fact been sent to the property owners which was what prompted the lawsuit by the property owners. The issue in this case involved the deed restrictions and whether or not property owners were allowed to use their residence as a short-term rental, similar to a bed and breakfast or VRBO. The HOA took the position that this was the same as operating a business and therefore not allowed in Timberwood Park according to our deed restrictions. The following are summary comments and not reflective of exact verbiage or specific statement, but rather meant to convey the general discussion being held during the meeting. Mr. Markel spent a fair amount of time explaining to the audience that he has been familiar with all 60+ units of Timberwood Park since 2010 when he first became aware of the development and worked on the turnover process. He went on to discuss how we had an extremely unique development in that were were 60+ units with varying deed restrictions, and as such it would only be possible to change the deed restrictions in a given unit, one unit at a time. An audience member asked how could that be done? One of the many comments included it would take lots of shoe leather. In other words, door to door participation by property owners to achieve a change in a given unit. That discussion included a summary that EACH unit of the development must independently hold a vote of property owners of a specific unit and then receive majority votes of those unit property owners in favor of whatever the change might be to the deed restrictions. Then, and only then can a new or amended deed restriction be added after it has been recorded to run with the land as the original deed restrictions did. IMPORTANT NOTE: Unless a vote has been held by a given unit of its property owners for a change, deletion, addition, or amendment of a restriction within that unit, it is not enforceable no matter who wrote it or how it was added to our development operations. IT CANNOT BE DONE! Think of Timberwood Park as a development of 60+ small organizations (HOAs if you prefer that term). Each unit must adopt legally ANY change, addition, deletion or amendment that might be being considered before it can become law and run with the land. That process is voting in majority within the unit of property owners to do so. Again, this has been reported and discussed on numerous previous occasions to provide property owners with information essential to making informed decisions with regard to the use and enjoyment of their property. 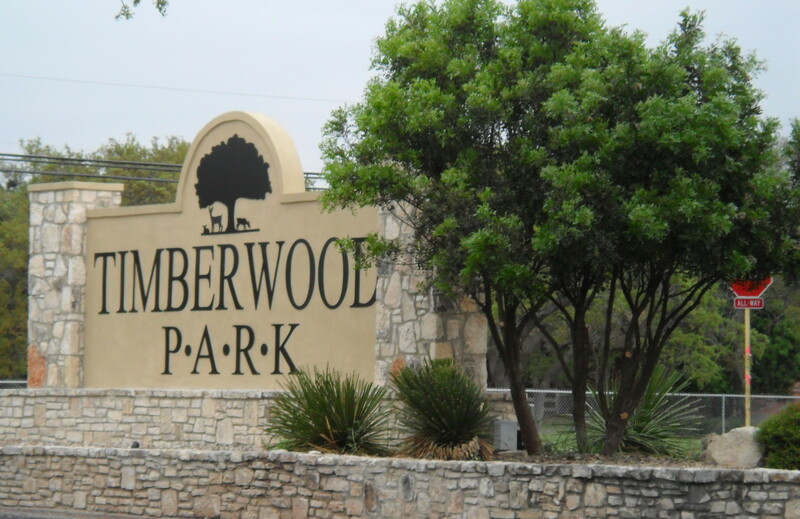 One of the things Timberwood Park is known for is the lax deed restrictions and lack of control the HOA has over our everyday lives and property. Most people when purchasing property in Timberwood Park, read their deed restrictions and those deed restrictions are one of the many draws to living here. I’ve heard it said over and over that people don’t want an overzealous HOA that checks to see how high our lawn grass is, decides when a garbage can should come in off the street, or won’t allow people to have the recreational toys they have purchased like a boat or an RV on their property. Our deed restrictions were originally written keeping in mind that the developer didn’t want property owners to be over regulated on their property, so our developer produced a basic set of restrictions that run legally with our land which you receive at closing in your title report as a result. You can find each unit’s restrictions posted on the web page under the documents tab if you want to see your specific unit restrictions. Mr. Markel provided further content to the audience regarding the recent ruling stating that the property owners were in the audience and that they would probably not provide too much comment because they intended to submit additional items to the remanded lower court that will be looking at the Supreme Court ruling for the final dispensation of the case. Simply stated, Supreme Court ruled against the HOA and in favor of the property owner stating there was not sufficient deed restrictions outlining what constituted a residential use of the property versus a business use of property. In the courts opinion the property owner was using the property in a residential manner. People in the audience questioned that logic stating things like “I don’t want a weekend rental next to my home, I have small children in my home”, and “this does not seem like a ruling to help keep up property values”, and so on. Again, as was outlined in the last blog, whether you agree with the decision or not, the Texas Supreme Court has ruled that the property owners have the right to have short term rentals on their property given the current deed restrictions. Audience members questioned whether the ruling could be overturned. It is this author’s understanding that once the court rules, it is not reversible, but comments included that there was potential for a reversal if the lower court could be shown additional detail which was felt to be missed in the upper courts ruling. Hmm. I guess that’s for a wait and see what the lower court does with the remanded case after the Supreme Court ruling. Questions were asked about fining property owners and why that was occurring when there was no provision in our deed restrictions to allow for fining. Answers were several, but summarily the discussion by our board and the legal team was that the HOA board can produce additional documents and guidelines via the HOA by-laws as additional tools to govern the development more effectively. IMPORTANT NOTE: Again, it is not possible to make up new deed restrictions which are legally binding against our land unless each unit votes in majority to make changes to the existing deed restrictions!!! Again, if it doesn’t run with the land, it isn’t enforceable or legal. Hmm. Again, I do not believe the by-laws trump the restrictions. The legal team seemed uninterested in discussing the fining policy or the ACC which were also brought to the discussion as extremely invasive to the point that property owners cannot do anything without approval by the ACC and if they do they are fined. The legal team indicated this was not the topic they were there to provide content for. Hmm. If they represent all of “us” should that not be something they can enlighten “us” about since they were in attendance? The legal team also seemed rather defensive about the entire discussion. Again, if you are representing all of “us” why not answer questions posed by all of “us”? Of potential additional interest, during the pre-meeting discussion, I overheard a conversation between Spectrum and a property owner involving the fining policy. The property owner was discussing with the Spectrum representative the fact fining was not provided for in our deed restrictions and our HOA therefore has no right to fine for any reason. The conversation sounded as though the Spectrum rep understood what the property owner was stating and agreed with that position. Our deed restrictions only allow for a lien to be placed on a property should it need to be cleaned up by the board or affiliated services to do so for a violation which is outlined in our existing deed restrictions. Again, this pertains to our existing, legal deed restrictions. Those made up after the fact and not voted for by property owners do not exist! No fines, no suspension of use of the park, no other restrictions to my knowledge exist in our existing deed restrictions. There were several other questions, but generally the answers were short, abrupt, and even a bit irritated and didn’t really allow for a discussion of the topic in full. The legal team departed as soon as the short term lease topic was closed, and several property owners followed them into the parking lot to have an opportunity to ask questions. Next topic was about our architect for the future proposed clubhouse. Apparently, the architect became unresponsive and wasn’t finishing tasks as provided so the HOA board fired them and hired a new architect to continue the project. Wonder how much that will cost us now? There were two other agenda items – social events and citizens to be heard which were quickly dispensed and the meeting was adjourned. Here’s what I took away. We had a Texas Supreme Court ruling in favor of a property owner who sued the association (HOA) because they were attempting to limit their rights to use of their property under our current deed restrictions. We cannot amend, add, delete or change anything in our deed restrictions without doing so unit by unit to EACH unit of Timberwood Park. A majority vote of owners in a given unit must take place affirming that change, amendment, deletion or addition to the restrictions and then a recording process needs to take place to make it legally run with the land going forward. The HOA board cannot arbitrarily decide what constitutes a restriction. If it doesn’t exist in our legally binding documents, it isn’t enforceable. While the board, and “our” legal team stated repeatedly this case’s defense will be paid for by HOA insurance, I never once heard that damages the property owner may seek were to be paid by insurance. And if they are paid by insurance, does that mean we will be cancelled and not insurable down the road? Does that mean the HOA might decide to assess a special assessment to each property owner to pay for the damages, etc. if they are not covered by our liability insurance. There was finally a comment that so far the board has had to pay the deductible on our insurance policy, some $5,000.00 in expenses so far. And what about the next case already underway in our legal system brought against the HOA by a property owner for ACC issues, variances, fines and other matters which have kept them from completing an improvement project on their home for more than 2 years? Will the insurance cover that lawsuit as well? Will the insurance pay for damages if the property owners win? If we don’t have the funds available to settle these cases, the next step most likely will be to look to property owners for a special assessment to cover the costs associated with these cases. Is that how you want your money spent? Are you ready to be held accountable for a potential special assessment to defray these costs should the insurance not cover the settlements? Video and audio of the meeting will be posted in the coming days to give those of you who have been unable to attend the meetings an opportunity to see what happened at the meeting. Stay tuned!